Oil Panic | 2P START! I’m a big Game & Watch fan, so I’m glad we’ve finally done a Game & Watch comic! 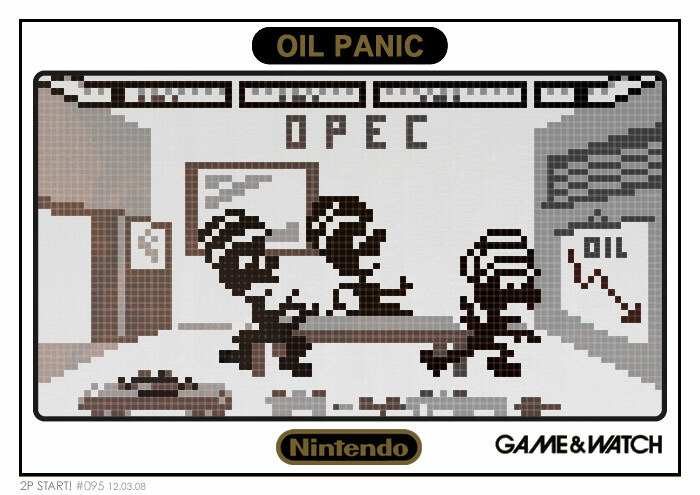 I never owned Oil Panic, but I still own my Mario Bros. G&W from when I was about 6 years old and it works great. My brother and I would play it on long car rides, him controlling Luigi and me controlling Mario. I’m not sure how something so simple kept us so entertained, but it sure was great fun. I’ve found a couple more G&W games at garage sales that I snatched up, but at the prices they go for on eBay, I doubt I’ll get many more. For those that don’t know what OPEC is or haven’t noticed that filling up your gas tank costs about half what it did six months ago, you probably didn’t understand the comic, so my apologies! Finally, we do know that the pixels shown aren’t true to the original G&W LCD screens, so for the record, this is the Game Boy remake which DID have pixels. Ha! lol great comic guys. not one of your best but still great. just so you know at lest one person gets it. Sorry, not much to say about this one other than NCG. 😀 Actually, maybe I have more to say. Well, I laughed, that’s for sure, and the art is really spiffy. Its simplicity it part of what makes it awesome. Like Pong or something, its simple, but great. Even though its only one panel, it’s still really awesome. Great job! By the way… do I see SHADING around the edges of each ‘pixel’? Or am I just going crazy? Awesome job with all the pixels. And nice joke too. You’re not crazy… the image is a jpg. Solid blocks of colour are not really friends of the almighty jpg. Png would probably have been a better choice. Or maybe Ray just thought that the jpg looked cool. I quite like the slightly blurry look it gives to the pixels actually, though I’d be interested to see what the original vector image looked like. OMG. This is so brilliant. Ray, Tim. I love you. This is the best comic you’ve ever done. I want to have your babies. OMG i’m laughing my A** off right now. I did a few tweaks to the colors to make it more than just grayscale, so there actually are some subtle gradients of gold running through. You can notice this the most on the left half of the comic. The blurry pixels are probably because of JPG’ing it to death. You can thank Tim and his evil restrictions for that. I’m not sure I’m ready to have kids yet. Then how are you going to have the spinoff, 2P START: THE NEXT GENERATION ? It will star Your daughter, Rayline and Tim’s son, Tom. It’d be an instant hit! And I love the logo this week! Awesome comics guys. Great art from Ray (as always) and a good joke from Tim. Awesome title image this week as well. I really like the comic. Great Job!! I have the G&W gallery game for GB, so I don’t have a problem with the pixels.. This makes me want to go play it now. Wow, very different from your average 2PSTART! comic (I mean that in a good way). I didn’t even realize I was at 2pstart.com until I saw Tim’s post below it. NCG. Can we attempt to not be creepy for a couple of seconds? I understand it’s hard…but try. Honestly, the comic was really funny, but the Mario Kart Wii one is still my favorite. I’m having Tim’s first as well. As soon as I eliminate Sarah that is. See, I realized as soon as I typed “2pstart.com” into my browser and hit “enter”, plus the giant “2P START!” logo (which I like this week) clued me in as well. and as to the ‘babies’ disscussion…. wtf?! Hey I work in NYC and all I hear about is how much we are stuck in some “dark times” and honestly its nice to take a lighthearted approach to it all, just like this comic. I totally love it. FYI Ray, I am listening to all the old podcasts for the first time, and as far as Sonic Unleashed goes, I think you might enjoy listening to your “present of future Christmas” gift to Tim at about 13 minutes into Episode 10. Something has gone wrong in 2pstart’s comments. The awesomeness of Ray and Tim have turned us gay. OK, I actually have to give you that one then. For me, this is the only one I check on Wednesdays that doesn’t update at or close to midnight (EST), so I usually check the rest before bed and have to wait until during the day for this. I also usually check at school if I have a chance between classes, so no bookmarks for me there. And I understand the top banner thing. Pretty much 90% of sites use that for ad space, and the ones that don’t have the same banner all the time, so there’s no need to look at it every time. But anyway, I guess I stand corrected. ncg, though this really does need to be a wallpaper. Great comic guys! I also love game and watches. My favourite is the mario cement factory release. In general, great work, with that nice almost sadronic undercurrent of humour I’ve come to expect. Keep it up. u should make a before and after comic about the same theme, this guys some months ago where abusing of us with high gas prices. Great catch, ultimateDK. Very funny to listen to that now. Good thing I emphasized ‘..but actually make it good’. This is great! How do you win?